True to its name, the State-of-the-Art Nitrogen Upgrade Program leverages the latest technology and innovation to clean up the Chesapeake Bay and the environment around our nation’s capital. Alexandria Renew Enterprises (AlexRenew) is an advanced water resource recovery facility — previously known as a wastewater treatment plant — that serves the City of Alexandria and parts of Fairfax County, VA. Designed to transform 54 million gallons of wastewater per day on just over 33 acres, AlexRenew is one of the smallest gallon per acre facilities in the nation. Being a good neighbor on a space-constrained urban site within the ecologically sensitive Chesapeake Bay watershed takes ingenuity. In 2016, AlexRenew completed construction on its $160-million State-of-the-Art Nitrogen Upgrade Program (SANUP). This project, nearly 10 years in the making, was designed to protect the Chesapeake Bay by meeting more stringent nutrient limits. SANUP meets these nutrient challenges in a way that conserves space, achieves resource efficiencies, and involves the community. The plan combined three different innovative processes that work together to support AlexRenew’s vision and meet its nitrogen reduction target. The Chesapeake Bay is the largest estuary in the U.S. It borders Virginia and Maryland, but its watershed spans 64,000 square miles across six states and Washington, D.C. The bay is impaired by nitrogen, phosphorus, and sediment. According to the Chesapeake Bay Program’s Bay Barometer released this February, the bay’s condition is improving, in part because the region’s water resource recovery facilities have met key nutrient reduction milestones 10 years ahead of schedule. Driven by efforts to protect the bay in the late 1990s, AlexRenew initiated a $350-million nutrient upgrade to achieve an effluent limit of 8 mg/L total nitrogen based on permitted flow of 54 million GPD. In 2011, new assessments showed that additional nutrient reductions would be needed to improve the Chesapeake Bay’s water quality, necessitating the SANUP program. Starting in 2017, AlexRenew is reducing its effluent total nitrogen concentration to just 3 mg/L, a nitrogen load cap of 493,000 lbs/ year. With SANUP, AlexRenew’s total nitrogen discharged to the Chesapeake Bay will be reduced by an additional 20 percent annually. AlexRenew is located in Old Town Alexandria, VA — just outside of Washington, D.C. — a dense urban area along the Potomac River. The site is bounded by a large electrical substation, Interstate 495, a historic cemetery, and commercial and residential development. Just west of the facility’s main campus is the South Carlyle site, previously an unregulated landfill and part of the area AlexRenew acquired to expand its facilities. This brownfield with contaminated soils required detailed sampling and analysis. AlexRenew was further challenged by resource protection areas that covered half of the South Carlyle site, as well as the need to create a consistent aesthetic with surrounding development. AlexRenew, in partnership with the consulting firm CH2M (Herndon, VA), developed a technical plan that embraced these various challenges while delivering on the utility’s vision to protect the environment, contribute to a vibrant local economy, maintain stable rates, and involve the community. The plan combined three different innovative processes that work together to support AlexRenew’s vision and meet its nitrogen reduction target. These include mainstream and sidestream deammonification as well as a nutrient management facility that balances diurnal influent ammonia loading. The microbial population must be carefully balanced so that Anammox bacteria can outcompete other microbes in the biomass. AlexRenew uses hydrocyclones to separate the heavier Anammox granules to keep them in the reactors while lighter biomass is removed. Deammonification is an emerging technology that uses anaerobic ammonia-oxidizing bacteria, or Anammox, to remove nitrogen. By taking a shortcut in the conventional nitrification/denitrification process, Anammox bacteria use less process air — saving energy — and also less supplemental carbon — reducing the number of chemical delivery trucks visiting the facility and decreasing greenhouse gas emissions. Deammonification also offers a way to remove nitrogen in less space without additional aeration basins. AlexRenew’s implementation of full-scale sidestream and mainstream deammonification is a milestone in the development of these technologies. In March 2015, AlexRenew started up its sidestream centrate pretreatment facility. The facility uses Anammox bacteria to treat the ammonia‐rich sidestream from dewatered, anaerobically digested biosolids. The centrate holds as much as 25 percent of all nitrogen in the wastewater at AlexRenew. The centrate pretreatment facility — among the first of its kind in North America — can treat 276,000 gallons of centrate per day, removing 85 percent of the total nitrogen from this waste stream. The process was designed to use 60 percent less process air than conventional treatment, with no supplemental carbon required. In spring 2017, AlexRenew will launch mainstream deammonification in its biological reactor basins. Mainstream Anammox is expected to reduce supplemental carbon use by more than 40 percent and aeration use by 26 percent while increasing biogas production by 10 percent — all with minimal capital investment, helping AlexRenew meet is fiscal sustainability goal. AlexRenew’s implementation of full-scale sidestream and mainstream deammonification is a milestone in the development of these technologies. As such, AlexRenew is collaborating with universities, research organizations, and other utilities, including its international partner, VandCenter Syd (Odense, Denmark), to monitor, refine, and quantify any improvements. The largest SANUP component, AlexRenew’s nutrient management facility (NMF), is an 18-million-gallon structure made of more than 1,700 precast concrete panels. The NMF stores primary effluent during daily ammonia peaks to balance ammonia-nitrogen loading to AlexRenew’s biological reactor basins. Maintaining a constant nitrogen load to the biological reactor basins helps AlexRenew optimize microbial chemical use and air demand, all on a very limited footprint for treatment. The facility — located on AlexRenew’s South Carlyle site — is topped by Limerick Street Field, a public, multipurpose athletic field that transforms a historic city garbage dump into a community amenity. In December 2016, the Institute for Sustainable Infrastructure honored the NMF with an Envision Platinum Award — the first in Virginia and the D.C. metro area and also the first for a U.S. water resource recovery facility. Envision is a tool used for planning, designing, and rating all types of sustainable infrastructure projects, much like the LEED program is used to assess buildings. Through a public-private partnership, AlexRenew, the City of Alexandria, and developer Carlyle Partners constructed Limerick Street Field and the Environmental Center, AlexRenew’s administrative headquarters. The field and building share a consistent aesthetic with the South Carlyle development, acting as a buffer between AlexRenew’s treatment tanks to the south and the 1.2 million square feet of planned residential and commercial development to the north. Their integration also provides field access and a seamless connection to planned biking and pedestrian paths. Additionally, the NMF and Environmental Center both use AlexRenew’s reclaimed water for nonpotable purposes. Four activated carbon treatment vessels (left), each with a capacity of 15,000 cubic feet per minute, treat odorous air in the NMF tank headspaces and exhaust clean air away from the field. The NMF operating gallery (right) houses process pumps, pipes, valves, and instrumentation to reduce the need for routine access into the tanks. During design and construction, AlexRenew worked with the public, stakeholders, and its public-private partners. The utility created a website for public comment that included community updates, blog posts, and a webcam to show current construction progress. As part of an ongoing commitment to be a good neighbor, AlexRenew’s NMF operates with an advanced odor control system. Due to various site constraints, less than half of the 10-acre South Carlyle site was available for development. Because of its history as an unregulated dump, the site was enrolled in Virginia’s Voluntary Remediation Program, which encourages environmental cleanups that may not otherwise take place. Resource protection areas, which covered about half of the site, were not only maintained but repaired and improved as part of SANUP. Built connections to future trails and green space. To optimize space, provide public field access, and address contaminated soils, the team built vertically when possible and used pile foundations to support all structures. More than 2,200 precast concrete piles were driven on the project. The NMF is partially below grade, and all process piping, pumps, and chemical analysis equipment as well as allocations for future wet weather solutions, electrical systems, and instrumentation had to be internal to the structure or buried. 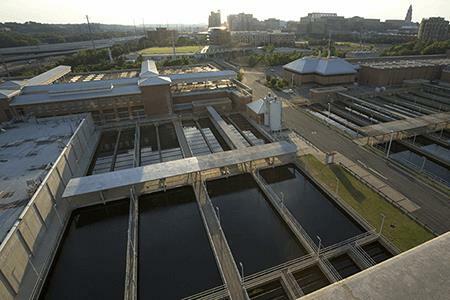 AlexRenew has a long history of innovation, driven by regulation, the need to process wastewater efficiently on its urban campus, and a customer-focused vision. The utility evaluates and leverages its unique circumstances so it can meet today’s challenges while ensuring a healthy future for its community. SANUP is just one example of how utilities can go beyond meeting regulations to implementing projects that transform communities. Kristina Twigg is a communications specialist at Alexandria Renew Enterprises with a background in journalism and water resources. Rich Voigt, PE, ENV SP, is a principal project manager with CH2M.